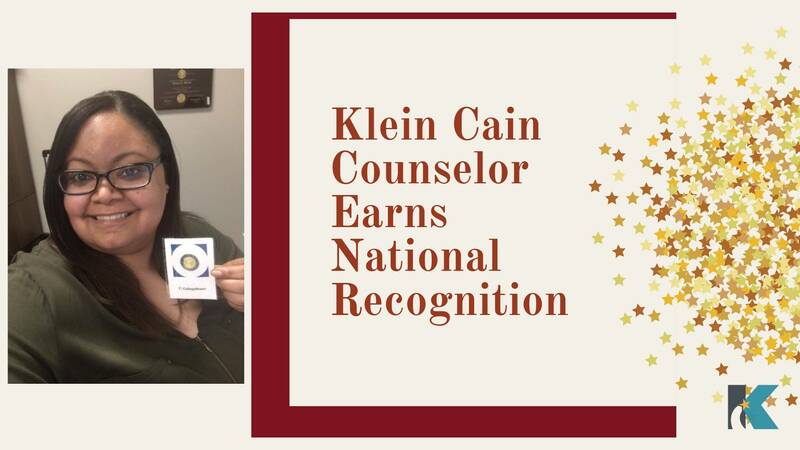 Tiffany Simon, a counselor at Klein Cain, has been named a 2019 exemplary Professional School Counselor by the national College Board Recognition Program. Klein Cain Lead Counselor, Delia Baker, who nominated Simon for the award, believes that this relationship-driven honoree is committed to ensuring that every student fulfills their promise. College Board hosts the recognition program to highlight the hard work and dedication of innovative, results-oriented middle, and high school counselors that display a commitment to student opportunity and success. Simon was chosen by College Board based on criteria such as leadership and advocacy, developing and coordinating collaborative partnerships and consistent professional development. Sound familiar? That’s because our guiding documents, which Simon grounds herself in, mention many of the same principles. The largest initiative that Simon led was the iconic Hurricanes After High School program for Klein Cain juniors. The event brought representatives across various college and career fields to present to the students during school hours. Simon became a counselor because she always knew she had a heart for students and wanted to help connect them, as well as their families, to resources that would help them succeed not only in school but in life. She, along with her fellow counselors, spend countless hours working to see the Promise2Purpose vision come to life in students like sophomore Mya Drummond. Although it’s no surprise, we are so proud that Simon’s deep commitment to the promise and purpose of others earned her this much-deserved national recognition.